Sometimes bikes are launched that fail to excite and slip under the biking radar for one reason or another. We find three of the best. Timing, as your better half has probably told you at one point or another, is everything. Letting out a ripping air biscuit that clearly identifies every one of the spices in last night’s curry at the moment she nestles up for a loving cuddle is bad timing. A witty joke, delivered at precisely the right moment, that leaves a table of guests in floods of tears and you basking in your own brilliance is good timing. Sometimes manufacturers deliver a stinking air biscuit. More often than not the bike in question isn’t that bad, usually it is pretty good, but the timing is all wrong. It could be that a rival manufacturer has chosen the same year to launch a similar styled, but far superior, model. Or simply that the marketing on the bike in question is all wrong. Either way the bike doesn’t sell, slips out of magazine tests and becomes almost invisible to the average, mainstream, buyer. Which is where we now pick them up. Armed with a budget of £4,000 we took a long, hard, look into the second-hand bike market to come up with three bikes that for one reason or another slipped out of popularity. 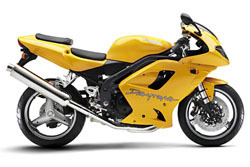 Triumph’s Daytona 955i was never the Japan-beating superbike that it promised to be, and neither was Kawasaki’s ZX-9R. Both fell foul of the R1, GSX-R1000 and Fireblade. Honda’s Hornet promised so much, but when it arrived it failed to excite the hooligan crowd or tempt the commuters. Now the dust has settled and a few years have passed, should our opinions of them change? There was a period in the late ‘90s that Triumph genuinely felt it could match the Japanese. It couldn’t. Since this time the management has had a re-think and worked out that to beat the Japanese you have to offer an alternative, not a competitor, but the 955i is a throwback to the era of optimism. 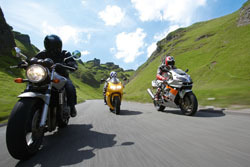 The 955i is directly related to the T595, which Triumph confidently predicted would take on the FireBlades of the day. Unfortunately a year after it was launched the R1 came out and blew the triple into the weeds. Well, further than the Blade had already done anyway. 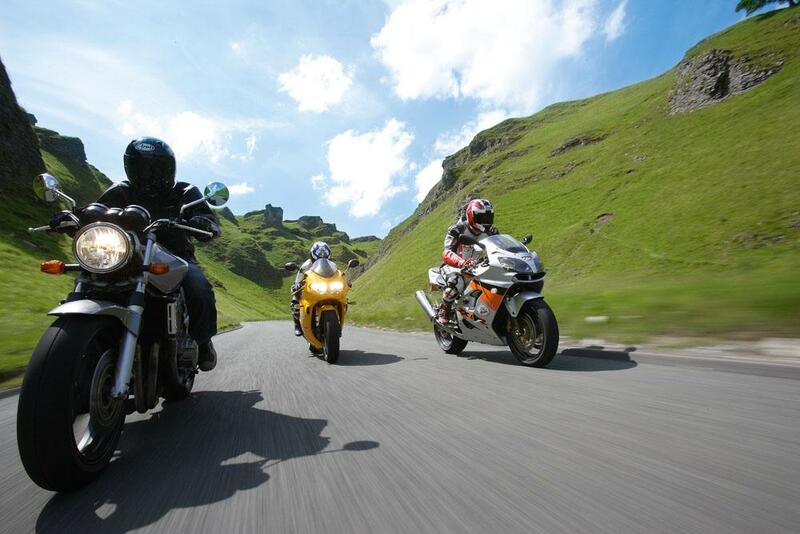 So the Daytona became a seen as second-rate 1000 sportsbike from the UK rather than a genuine Japanese alternative. Which totally misses the point of the 955i. On track it’s never going to come close to a Japanese 1000, but it’s on the road that the 955i excels. Think of it as a brisk sports tourer with a huge amount of character and you will start to understand its charm. All right, on first inspection this bike looks firmly stuck in the ‘90s. The fairing, clocks and styling look very dated, but only because they are far more rounded than current trends dictate. Fire it up and you instantly forget its visual inadequacies. The 955i is a charmer, and most of this charm comes from its lovely triple motor, which not only sounds fantastic, it rides beautifully as well. Get over the fact the gearbox is fairly agricultural and clunky and instead enjoy the lazy power of a triple. As with most triples the torque is delivered in a flat dollop from the word go in the rev range. It’s not ‘oh my god’ fast like inline fours, but that’s not to say the 955i is slow. Get it spinning and it’ll top 160mph, which is impressive, and it’s more than happy to knock off big miles with the rider in relative comfort. Unlike the ZX-9R it doesn’t have a huge fairing, but what it does have is effective, although its trump card is the comfortable riding position and subtle suspension. Triumph test riders are very good at ensuring bikes leave Hinckley with not only a real world riding position but also real world suspension. The 955i comes with one of the most padded seats this side of Honda’s GoldWing and some beautifully set up suspension, proving that to make a bike handle well on the road you don’t have to be riding an ironing board. With second hand prices fairly cheap the 955i is a great alternative to a Japanese sportsbike for a rider who wants something different that is fast, but not completely over the top, and comfortable as well. 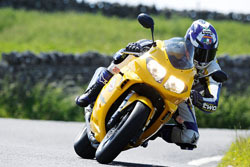 I’ve done a fair few miles on a Daytona 955i and I really enjoyed it as a riding experience, not a visual one. I like the frame, the handling is solid and fairly sporty, and engine but everything about the bike is so old hat. Looks are quite important to me, and even taking into account it is a second-hand bike the Triumph looks so dated. Moving aside from the visuals the engine is great. I never get bored of the bark from the triple and the combination of the excellent torque and fairly peppy top end is relaxing to ride on the road. The gearbox, however, isn’t very good and calling it sloppy is doing it a favour. 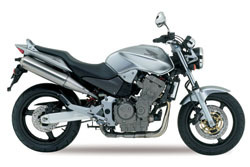 In 2002 Honda’s Hornet 900 promised so much. A streetbike using the 919cc FireBlade motor ticked all the right boxes for potential owners who wanted a bit of naked fun in their lives. Then the bike arrived. Honda ‘retuned’ the Blade’s motor, and in doing so sucked all the fun out of it. The Hornet 900 wasn’t an insane wheelie beast, it was a big capacity commuter. Instantly this ruled out the nutter crowd, but the commuters didn’t like it either, sticking to its baby brother, the Hornet 600 instead. Then there was another problem, Yamaha’s Fazer 1000. Launched in 2001 the Fazer used a ‘proper’ R1 engine, virtually full power (well 122bhp) and although the chassis was sloppy, it was comfortable and had a half-fairing, which appealed to commuters. And so the Hornet slipped into the middle ground and was over-looked. Until now. Second hand you can get a mint two year-old Hornet 900 for £4,000, even less if you try. That’s £2,000 less than it cost new and makes the bike look a bit of a bargain. The build quality remains excellent, the engine is bullet-proof and it looks cool. So is it a bargain? Yes. To ride the Hornet is a hoot. The engine is a bit flaccid and insipid and only makes 96bhp, but it’s got a stack of mid-range and can be encouraged to entertain. The motor never feels underpowered, which is a credit to the retuning work Honda has done, but it does have a slight flaw, it vibrates a lot. Like its baby brother the Hornet 900 buzzes its way along the motorway, which can be a bit irritating. Stick to the back roads and this is easily over looked. And it’s the back roads where the Hornet rules, because it has a very good chassis. In a straight race it would pummel the Fazer 1000 as well as the Z1000 thanks to a stiff and unflappable chassis that feels like it is desperate to be tested with more power than the Hornet actually has. There is none of the wallow that you usually get with street bikes, which is a pleasant and very welcome surprise, but it does have other typical street bike irritations. The Hornet has a total lack of weather protection, and an optional fly screen does little to counter this, the fuel range isn’t fantastic and if you run it through winter the engine gets a hell of a battering from the salt. Also the brakes aren’t brilliant, but only if you are really testing them. For the rider who wants a street bike, but without the hassle and aggression, the Hornet 900 is a top buy. It’s not a very good commuter, but for shorter weekend rides it’s a refined blast. I always find the Hornet 900 a bit of a disappointment to ride. The 919 Fireblade engine is beautiful and I would love to ride a street bike that uses it, and not a watered down version like the one we have here. That said, get over the fact it is a little insipid on the engine front and the Honda is actually a really nice bike to ride, as long as you aren’t going bonkers. Sit back, relax and just enjoy the mid-range at sub-80mph speeds and the Hornet works well. The chassis is excellent, more than up for rapid back-road riding, and the whole package works very cohesively. In many ways you have to feel sorry for Kawasaki’s ZX-9R. It never asked to be labelled as a sports bike, well not towards the end of its life anyway. No, this old Ninja just wanted to grow old gracefully, and not be bothered by the young whippersnappers that were springing up all around it. Unfortunately it never got the chance. 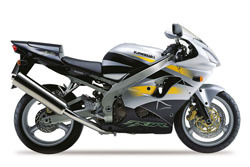 Realistically, from the moment the R1 appeared in 1998 the ZX-9R was screwed. Royally so when the GSX-R1000 appeared in 2001. From this point on it became the litre-class’ whipping boy as Kawasaki desperately ploughed development money into the forthcoming razor-sharp ZX-10R. But ironically the ZX-9R’s shortfalls against these high-tech sportsbikes have, over time, made it a very good second-hand buy. For a start it’s a physically big bike with a simply gigantic fuel tank that spreads your legs wide apart. Unlike the equivalent sporstbikes of the day, and the current models for that matter, you aren’t perched up high, the ZX-9R envelops you lower half, creating a comfortable riding zone. Then there’s the huge screen and fairing. Against the current thinking of minimal screens and frontal areas the Kawasaki looks bulky, but it’s effective. When you’re riding the wind is deflected around your body and over your head with only the help of a slight crouch. And it’s comfortable. The pegs aren’t set too high, fairly sporty but not excessively so and certainly no more than, say, a VFR. The bars are splayed wide and even the clocks are large and clearly read, although the speedo does have a bit of a jumble of numbers on it. 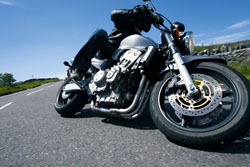 The highest of which is 180mph, hinting that there is more to this bike than meets the eye. In the case of the ZX-9R it’s a genuine 134bhp at the rear wheel. Yes, like all big Kawasaki’s the ZX-9R has a monster of a power plant. The inline four engine is still impressive today. Near perfect carburation (from carbs, remember them?) and a big dollop of midrange makes this a beautiful bike to ride if you aren’t into screaming a motor. If you are, work it and there is a good solid rush of acceleration to be enjoyed. And the handling isn’t bad either. As standard it’s slightly soft and isn’t quite as eager to turn as a more focussed sportsbike, but this can be solved by raising the rear end a bit. But in truth, what’s the point? Enjoy the ZX-9R at a comfortable, but still brisk, pace one or two up and it’s very easy to fall for its relaxed charms. Consider the ZX-9R as a very fast sports tourer that’s cheap, reliable, comfortable and doesn’t look pipe and slippers at all. A proper roadbike, then. And most importantly it isn’t a VFR! It has been a while since I rode a ZX-9R but I still have a bit of a soft spot for them. The riding position is lovely for road miles and the engine is silky smooth with no vibes and heaps of power. While on track the bike’s weight and relative lack of power when compared to the R1s of this world make it feel a bit lethargic, on the road it’s got more than enough and most importantly the power is delivered smoothly. When you’re looking at a bike that still provides a genuine 134bhp you can’t really accuse it of lacking power, so enjoy the engine, price and comfort. 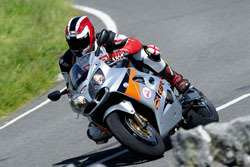 Both Kawasaki’s ZX-9R and Triumph’s 955i offer a superb, and slightly sportier, option to the all-too common VFRs. Comfort isn’t an issue on either of these bikes and who cares if you can’t get factory fit panniers? A set of soft luggage and away you go. Out of the two bikes the Kawasaki has the edge when it comes to ultimate performance thanks to its still impressive motor, but the Triumph’s triple offers a more relaxed ride with a ton of character thrown in and a beautiful exhaust note. Reliability-wise you would have to go for the Kawasaki, but don’t be too scared of the 955i, they aren’t as bad as headlines would lead you to believe. Which leaves the Hornet 900. With the launch of the new CB1000R it’s clear to see Honda has learned from its mistakes with the 900. The CB1000R looks adventurous, performs well and has grabbed headlines. Something the Hornet failed to do. But imagine looking at the CB1000R in four year’s time, will it still look cool? The Hornet 900 does. As a big capacity, comfortable and unintimidating street bike that has excellent build quality and a strong, if uninspiring motor, combined with a decent chassis the Hornet is worth a shot. And finally there’s an added bonus to these bikes. The beauty is that there is a price to suit any wallet. Although we picked out three that all retailed at around the £4,000 you can easily pick up earlier models for less. None of them changed that significantly in their lives so even if cash is tight one should be within your reach.